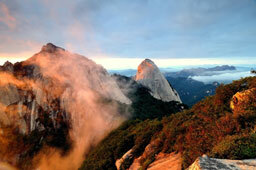 The Official Korea Tourism Organisation website provides a wealth of information for travellers to Korea. It is a must for you to read the website before you travel to Korea. Getting to Korea & Visas - International Flights (Korea's International Airports), Getting Around Korea, Travellers' Resources. 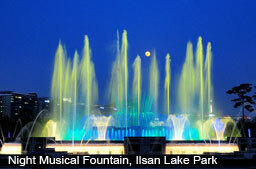 Lafesta (or Western Dome), Ilsanseo-gu, Goyang City - Not to be missed for nightlife and food! 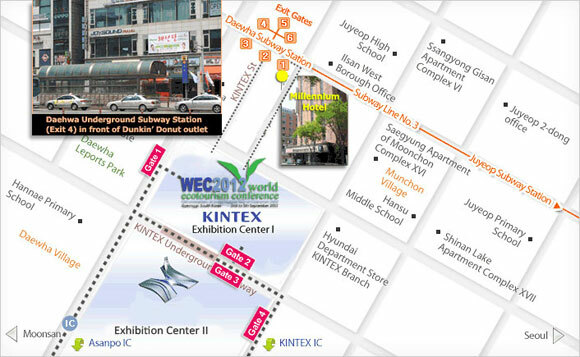 WEC2012's conference venue is at KINTEX, located next to Ilsan, a newly developed township within Goyang City, Gyeonggi Province. By public limousine bus #3300, it takes about 60 minutes, costing W9,000 per person (embark at Bus stand '8A' where you will find the ticketing counter and bus stop for #3300), which drops you at Daehwa underground subway station in Ilsan. If you are taking the Airport Bus to Ilsan Millennium Hotel, you have to disembark at the Daewha Station (refer to inset picture) and then walk to the hotel. Cross to the opposite side of the road and the hotel is inside a lane. You cannot see the hotel from the main street. By taxi, it takes about 40 to 50 minutes depending on traffic conditions. The fare is around W90,000. The Seoul Metropolitan Subway is an ideal way to move around in Seoul and the suburb areas like Goyang. It is also linked to the airports. You would be able to reach shopping malls and many places of attraction through their extensive rail network without hurting your pocket. KINTEX and Millennium Hotel (official 3 star hotel) is accessible via Line 3 with the nearest station at Daehwa Underground Subway Station. KINTEX and Millennium Hotel is about 10 min and 5 min walk from the station. Ticket vending machines and names of stations are also displayed in English. You may learn how to use the ticket vending machines here. Public Taxis are abundant but it is comparatively expensive. 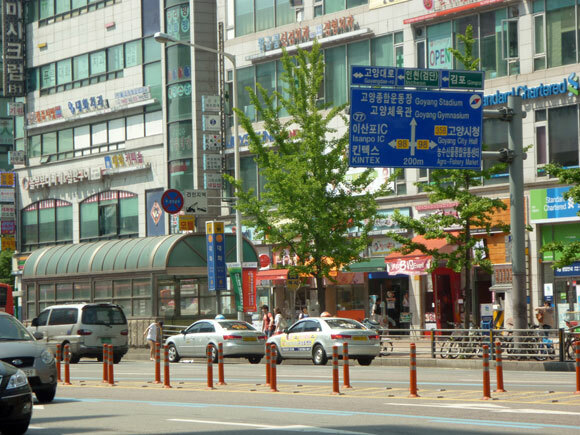 Many of the taxi drivers do not speak English and it is advisable to have the names of places and addresses written in Korean language for the driver. Public Taxis - Within Ilsan, Goyang to shopping areas - US$3 - US$4 one way for 5 to 10 min trip. 1) Stanford Hotel, Mapo-gu, Seoul (4 star hotel about 20 min drive to KINTEX). Complimentary airport transfers and hotel transfers are provided for registered delegates staying in the above official hotels. Delegates may book other supporting hotels on their own but no airport transfers or hotel transfers are provided other than to/from Stanford Hotel or Millennium Hotel. There are many 3 star hotels (many of the older hotel staff do not speak English) located near the Daehwa subway station in Ilsan, all within walking distance. You may not see the hotels immediately as they are located behind the main street. There are no 4 star or 5 star hotels in Ilsan. These hotels and Daehwa station is located just about 8 to 10 min walk to KINTEX. If you decide to stay in Seoul, you make take the Subway line No 3 to Daehwa subway station and from the station, you can just walk to KINTEX. There are directional signs from the subway and road signs as well. You may also want to take note that the subway journey from Seoul City centre to Daehwa Station takes about 90 min and stops at as many as 29 stations. NOTE: ALL DELEGATES VISITING DMZ MUST SUBMIT THEIR PASSPORT NUMBERS TO THE SECRETARIAT BY 14 AUGUST 2012 IN ORDER TO SECURE A PASS TO ENTER THE DMZ AREA. 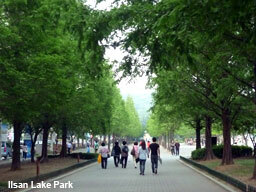 The ideal time to visit Korea is during the autumn months (September-November). During this time, the country experiences warm, sunny weather, skies that are cobalt blue and spectacular foliage. 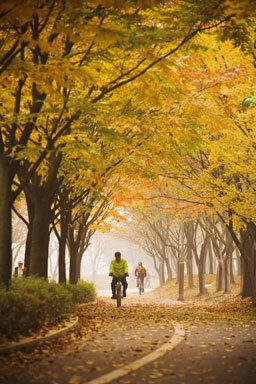 Fall is the best season to visit Korea because of clear skies and low humidity. Long slacks, long-sleeved shirts are recommended. 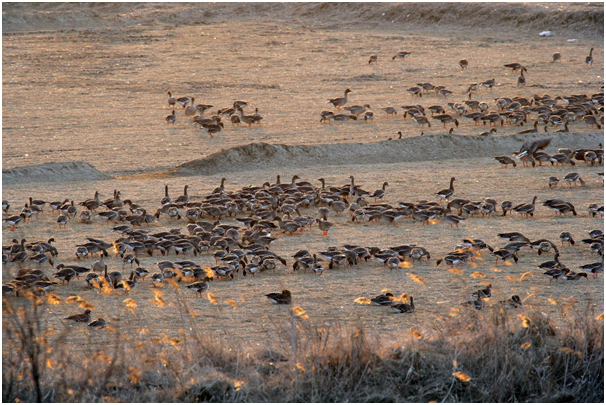 Cardigans or jackets may be needed as temperature falls at night. Mobile rental services are available at Incheon International Airport Arrival Hall on the 1st Floor. Look for Olleh, S-Roaming or SK Telecom counters. Rent a local phone with local number to save on calls. Rent a local phone and use your own SIM card to receive calls. Use your own phone and own SIM card. Charges are from your own country mobile service provider. At the Incheon International Airport, you can rent 4G Wibro modems (US$5 to US$10 per day) to have wifi service with high-speed internet and unlimited capacity. Find the Olleh counter on the 1st floor of the Arrival Hall. 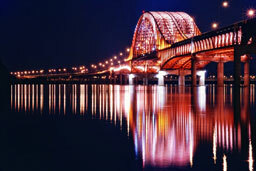 An easy way from Incheon International Airport to KINTEX is to take the Airport Limousine Bus on the 1st Floor - Gate 8A. Hop onto Bus #3300 to Ilsan takes you to Daehwa-Dong Subway Station near KINTEX. More details here. 1000 Korean Won is approximately 1 US Dollar. 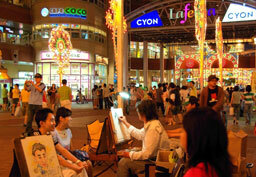 To have an idea of the cost of living in Korea, find out here.